Tesla charging at our curbside charger. 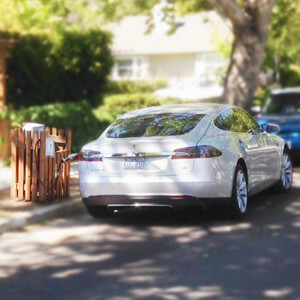 With an electric vehicle (EV), one typically installs a charger at the driveway or garage. We wanted a second charger at the curb outside our house, but the problem is, the land between the sidewalk and the street is public property. We got a 2-year pilot permit to install and operate the charger, from the city of Palo Alto. To our knowledge, this is the first such permit in the nation. If you are interested in doing same, see below for the full saga and the issued permit which may help you in your quest. Why did we do it? To promote the technology, help reduce range anxiety and have a place for guests to charge when visiting. Our new EV charger is located on public property, in the land between the sidewalk and the street that belongs to the city, typically controlled by the city's Public Works and/or Utility. Palo Alto has agreed to let us use this land, provided that the charging station is open to the public. We, the homeowners, are responsible for the installation, maintenance and insurance of the charging station, and we are providing electricity for public charging at our cost. We first researched the City of Palo Alto's permitting system and found that they have a permitting program for activities that occur in between the sidewalk and the street. It is a permitting process that allows activities in the "Public Utilities Easement" (PUE) and/or the City right of way (ROW). This process covers activities such as storing a dumpster or placing a fence in a PUE or ROW. We then worked with various city officials to get approval for what we call a pilot project. We submitted a proposal, which then went through various iterations in a number of meetings. Be prepared: we worked with the City's Planning, Building, Utility, and Public Works groups, and the city Fire Department. Our final proposal is available as a Word Doc below, so that it can be downloaded and edited to match your circumstances. From the city's perspective, the key issue was getting the correct insurance from our home insurance broker State Farm. The "ACORD Certificate of Liability" is a very specific form and ours is included in the document below. Note, the city only required $1 million in insurance, and there is a long story as to why we carry $3 million in insurance. With the accepted insurance form, Public Works issued the PUE permit, with some associated conditions. It is detailed, so read (attached below) it before you start to understand what will be required. 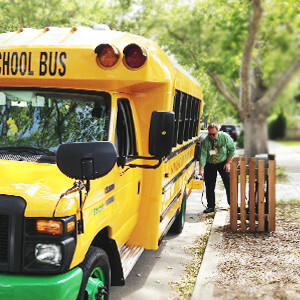 Prototype Electric School Bus charging up at Project Green Home! We also needed a Building Permit from the Building Department to install/operate the charger which included trenching, conduit & wiring under the sidewalk to our main panel. In essence, we completed the city's standard EV charger residential installation application; the Building Department took our proposal and turned it into the attached permit/ "job copy". Cost: Estimated at ~$1500. We were fortunate to get the chargers free via a California Energy Commission grant. In addition, the free metal post was made by our good friend Bill Peterson. Thanks Bill! The wooden screen around the charger was made from old 8" redwood fence planks, planed and cut to 3". Note, at present, we are still finalizing this wooden screen as in our opinion the original design does not adequately contain the cord when the charger is not in use. Note, we are giving away this electricity - it's free to the public. We have been rewarded not just by meeting the good people who charge their cars in front of our house but also knowing that we are actively reducing our energy and carbon footprint! Required Insurance Included w/ homeowner insurance. The Vetter family was unable to attend the Palo Alto City Council meeting, Sept. 23, 2013, to urge the city to expand the pilot EV charging program and mandate that all new construction in the city be EV ready. So they videotaped their testimony (along with their kids, and their Leaf, and their Tesla). The result: success! Thanks to this testimony, and a flood of support from the community, the City Council voted unanimously that all new construction in Palo Alto must now be EV ready, the permit process for installing EV chargers will be streamlined (and made more affordable! ), and the pilot charging program shown in this video will be expanded. Palo Alto is now one of the most EV friendly cities in the world! See http://bit.ly/15tid9D for a webcast of the 9/23/13 City Council meeting. Curbside EV Chargers are also starting to appear in the Berkeley area!